This is what happens when people realise they face the threat of losing their hospital – and when they see the media headlines for the dross they generally are. But the ‘news’papers have no intention of letting up on their ever-increasing campaign to demonise our health-workers and erode public confidence in, and affection for, our NHS. This morning, the Express and the Mail printed different but similar stories, both equally cynical and equally misleading – and very typical of how stories are slanted in the current anti-NHS campaign to appear far more damaging than they really should. Once you look at the details of the story with an objective eye, however, a very different picture emerges. They went into that hospital to get the treatment and care to make them better. Instead, one by one, they came out of that place in their coffins. Speaking to the Telegraph at the time, she told how doctors failed to notice her mother Pauline Nicklin, 71, had two cancerous tumours on her ovaries for two years before she died in 2006. My own mother died of ovarian cancer – a disease that has one of the worst survival-rates of any cancer, primarily because its nature and location means that it is rarely discovered until it is well advanced. Those who survive the disease are often those lucky enough to have it discovered by ‘accident’ in the course of treatment for something else. There is nothing at all in this situation to indicate any fault on the part of the hospital. Nine months later, her father Percy went to the hospital with a deadly foot infection, but was sent home without treatment. Convinced something was wrong, Mrs Wilhems took him back where he was diagnosed with blood poisoning and gangrene and died four days later aged 76. Hmmmm. This gentleman clearly shouldn’t have been sent home if he had septicaemia and gangrene – but in an A&E unit as overstretched as Stafford’s is known to have been, things get missed. But did this oversight lead to his death? The article states that he was taken straight back to the hospital where his condition was diagnosed, so there was no significant period where he sat at home untreated while his condition worsened – his treatment started the same day, so we have to conclude that he would unfortunately have died anyway. The ‘sent home’ episode was irrelevant to his death. Her husband Tom was also treated at the hospital before he died from a lethal lung disease but Mrs Wilhelms again complained of appalling conditions. The article doesn’t specify what the lung disease was, but by calling it ‘lethal’ it makes plain that he was going to die anyway. It is uncontested that there was poor care in 3 wards at Stafford – although it is largely ignored by the press and completely ignored by Jeremy Hunt, the Francis report makes absolutely clear that this was because these wards were woefully understaffed. However, it is also clear that while the poor care may have been uncomfortable and embarrassing (and as unacceptable to staff as it was to patients and relatives), it did not lead to ‘excess deaths’. It appears that Mr Wilhelms would have died no matter what the hospital did or did not do. The article is also misleading in its photos. Mrs Wilhelm’s home-made sign about her husband drinking from a vase makes no mention of the fact that he was on ‘restricted fluids’ for medical reasons – in other words, he wasn’t permitted to drink for his own sake, perhaps because of kidney problems or very low sodium levels, or because some other condition required it. Not necessarily comfortable, but right – he might well have felt thirsty, and may have found a vase to drink from even though they were banned in the hospital since the 1990s, but his thirst was not the result of any neglect. Quite the contrary, in fact. Mrs Wilhelms has my sympathy as a bereaved person. The Mail, which has cynically exploited her for the political ulterior motive of denigrating the NHS and detracting from the impact of the ‘Support Stafford’ march, most emphatically does not. The Express, meanwhile, ran a short but prominently-headlined article titled “No let-off for those guilty of needless deaths in hospitals“. This begs two questions, of course – were there needless deaths and was anyone ‘guilty’ of them – but the Express is hardly a stranger to unfounded assumptions. RITA PACE was 56 when she collapsed in a toilet and bled to death without anyone coming to her aid. However, the detail tells a very different story from the headline. It sounds like the futile end of some loveless junkie. It is, in fact, the preventable death of a beloved mother who died needlessly at Basildon Hospital in Essex from an undiagnosed aortic aneurysm. Leaving aside the fact that the assumption that all junkies are ‘loveless’ is self-evidently untrue, the Express betrays its ignorance and its agenda. An ‘aortic aneurysm’ is an extremely serious condition – a ‘ballooning’ of a blood vessel when the vessel wall weakens. Any aneurysm is very bad news – but an aneurysm of the aorta, part of the heart and the largest artery in the human body, is very, very, very bad news. It is also a condition that is usually unknown even to the person suffering from it until a very advanced stage or else if it is discovered ‘accidentally’ in the course of a procedure or investigation for another condition. If an aortic aneurysm leaks, and you are on the operating table, you have a chance of survival if the leak is slow and the surgeon is prepared and very capable. If it bursts, it doesn’t matter where you are – you will be dead in moments. Mrs Pace’s death was anything but ‘preventable’. She would, sadly, have been dead seconds after the aneurism burst whether she was in a toilet or in an operating theatre. The article does not say whether Mrs Pace was even a patient at the hospital. She may have been visiting someone. If she was a patient, she was evidently there to be treated for something else, since the aneurysm was undiagnosed. There is no suggestion of any neglect or misdeed by the hospital, which can hardly be blamed for not detecting a condition that is basically undetectable unless you are either very lucky or specifically looking for it. If Mrs Pace was able to go to the toilet unaided, there is no reason to expect her to be accompanied by a nurse or healthcare assistant. An aneurysm would not make her incapable of doing so, and there is no indication that she had any condition that would. Hospitals are short-staffed even for providing essential care, so to imply that every toilet or other room in the hospital should have a member of staff constantly present is simply nonsensical. Rita is among up to 2,500 patients who have died unnecessarily at Basildon in the past decade. What emerges is a shameful litany of neglect, incompetence and malpractice to rival any of the horrific cases catalogued in the Francis Report into Stafford Hospital. We’ve already seen that Rita’s death – though unquestionably tragic – was not ‘unnecessary’ or avoidable. It was just a sad, tragic event. This should immediately raise suspicion about the claim of ‘2,500 patients who have died unnecessarily’ – and rightly so. The Express tries to damn Basildon by comparing it with Stafford – but as I have demonstrated in various articles, there was no issue of ‘excess’ or ‘needless’ deaths at Stafford. Its ‘HSMR’ mortality statistics were entirely the result of problems with the data on which the statistics were based, problems with the way the data was entered, and problems with the statistical method itself. If this was the case at Stafford, there is no reason whatever to assume that there have been excess ‘needless’ deaths at Basildon. All hospitals have avoidable deaths, because treatment is provided by people and people are fallible – the right treatments can never be administered exactly at the right time, every time, and staff can never be everywhere at once. But the mortality statistics are so unsound that they should not, must not be used to quantify a number of ‘avoidable’ deaths – which is exactly what the Francis Report cited by the Express said. There was unquestionably poor care at Stafford – in only 3 wards out of many. But this poor care did not lead to ‘excess’ deaths – once the data was corrected, the hospital’s death rate was significantly below average. There may well have been poor care in some instances in Basildon – but that does not mean that ‘avoidable’ deaths happened that would not have happened with the best possible care. But then, the Express has never been shy of overreaching in its attempts to distort and prejudice. The only real value in either of these reports is that they give away so clearly the blatant bias of the right-wing press – and its blatant agenda to blacken the public’s perception of, and affection for, the NHS that almost all of us rely on, or soon enough will. It’s vital that we don’t fall for the shameless, distorted propaganda. So please spread the word and let’s shine a spotlight on these ridiculously twisted articles for what they are. The 50,000 who were there know what the tone was, what it was about and how they feel (essentially a community that has been manipulated coming together). A pity the press don’t see it as their duty to reflect that for the benefit of the 60m who might benefit from knowing. They might guess, however, from the pictures. The one you have used is, as you say, quite moving. Thank you, once again, for the corrective. My pleasure. Just wish I could have been there! This really angers me! The government spend millions on a funeral for someone who was hated! If he invested half of the money he spent on her funeral on our hospital it would be great! Services would improve! Staff are over stretches and over worked the parent to dr/nurse ratio must be silly!! And you can’t expect a 5* service without a 5* budget!! Hundreds of people go in this hospital everyday! It’s very typical you only hear the bad stuff and the negative!! They save lives there everyday and I for one don’t want the hospital to go instead of forcing closure how about joining us and protesting for a better health service eh! 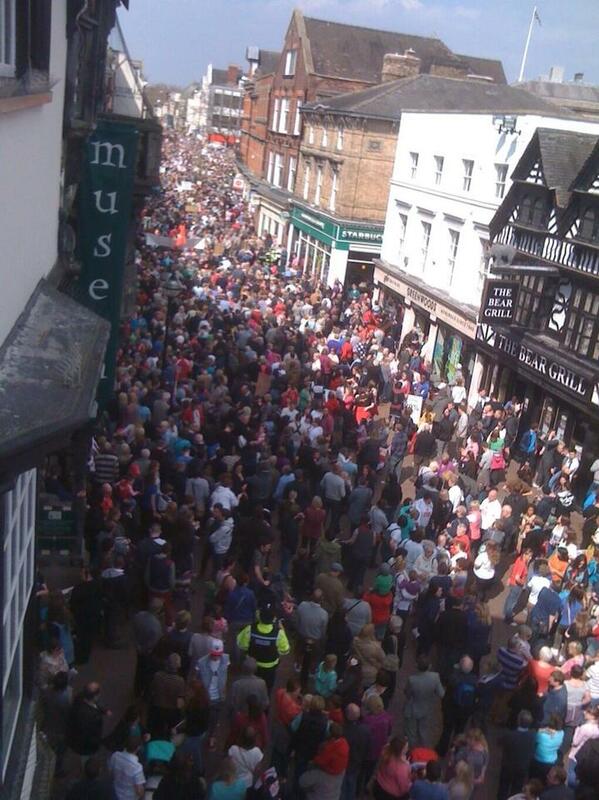 I was there marching on Saturday and felt so proud if my little town!!! And the amazing turn out! I used to work at Stafford Hospital, in theatre. It angers me so much that some people can’t see how the press (and others) are manipulating the situation. I agree that there was a period when the hospital was very short staffed, I believe the start of this to be around the time they were told by the then government to go for ‘foundation’ trust status, that meant balancing the books. I remember there being a recruitment freeze, no promotions and no one listening when we said we were short staffed. As a nurse we had to do the best we could in sometimes very difficult situations. I refused to send for patients for theatre when I didn’t have the staff & skill mix for the list, that was to maintain patient safety. Did I get in trouble? I had a manager (not theatre) telling me I couldn’t do that because of waiting list targets. At no time did I ever put a patient at risk and no I didn’t do what they said. I no longer work there as I am now terminally ill with Lung Cancer. I go to Stafford Hospital for treatment (chemo) My care has/is been the best I could hope for. I’ve done my homework/research and wouldn’t get better care in a large cancer centre such as Christies. I was diagnosed at an advanced stage similar to your story of ovarian cancer, I was in my 40’s and had never smoked so no one suspected I could have lung cancer. Do I blame the hospital? No? Once the hospital (Stafford) became involved I was diagnosed quickly. When I die will it be the hospitals fault? No. I was proud to be on the march. We need this hospital it is by far one of the best hospitals I have ever worked at and been treated by. Thank you for the brilliant comment and I’m so sorry to hear about your situation. I am an NHS worker in a city next to Stafford and a Staffordian by birth. It worries me that emergency ambulances taking patients from Stafford to Wolves, Burton or Stoke Hospitals will take 20-30 minutes each way, then the same journey back meaning that each emergency ambulance out of action for an hour plus. This is even more thought provoking, I have many family and friends living in Stafford and deserve to have emergency treatment when and IF they need it, Think about it, do you want to have to wait for an ambulance to return from Stoke before the Paramedics can deal with YOUR relative whilst they are having a heart attack, stroke , AAA , complicated or premature delivery/ pregnancy, road traffic accident…………..
Stafford have agreed to many more houses being currently built and more to come. I am sorry but potential home owners/ renters think carefully before you buy. Do you want to live in a large town or suburbs without a LOCAL Hospital. ? COME ON PEOPLE OF STAFFORD. FIGHT, FIGHT, FIGHT EVERY STEP OF THE WAY TO KEEP ALL SERVICES AT STAFFORD. Absolutely. When the A&E closed in a town 9 miles away from mine, they ended up having to draft in St John’s Ambulances to pick people up because so many ambulances were either en route somewhere or waiting at the central A&E to transfer their patients. Ridiculous, ill-thought decisions that a child would know are going to lead to problems – and cost lives. AND YES I also took part in the rally and spoke to audience via the mic on the day . Well said Steve – the reports of this event by the right-wing press make my blood boil. So may staff have been vilified over the last few years (and still are, if the responses to the Mail Online article are read) that it is clear this misleading figure of 1200 “unnecessary deaths” has entered the mythology and is still being actively promoted. I am not ashamed to say that when the frontline staff marched into the Market Square (in their uniforms, yes, which they were given permission to wear and which they won’t be wearing on wards duh) I couldn’t help but cry. I felt so emotional. Quite something for my first ever protest march! We have to stand up for this hospital – and we have to make it known that we are not prepared to have the same people who made the “unsustainable” decision (in the face of all clinical and financial evidence to the contrary) now deciding whether to uphold that decision! What a blatant piece of engineering that is – but do the press mention that? No! Make no mistake about it – Saturday was the start of something, not the end. Thanks again for all you do to support us. about time the people took to the streets to protest about the demise of the NHS , this goverment are trying so hard to privatise the nhs through the back door.some people need to forget about the past,and work for a better NHS for the future of our children, i sympathise with people who have lost there dearest ones in the past,but the crusade should stop against stafford hospital. Its time the Daily Mail was brought to account for it’s blatantly sensationalist policy – but people buy it! It actually disgusts me. As does the present government. do their best with the tools they are given!!! The govt undoubtedly has an agenda to close hospitals and will only change its course in a given instance if it becomes too politically difficult to continue. That’s why it’s brilliant that the people of Stafford are so galvanised, why they need to continue – and we all need to learn from them. to skwalker 1964, great article, used to live in Stafford and been to the hospital a “few” times, live in Cape Town now, can’t think of Stafford without a hospital, crazy. But thanks for keeping us expats up-to-date.